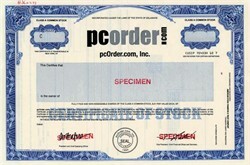 Beautiful engraved specimen certificate from the pcOrder.com, Inc . This historic document was printed by United States Bank Note Company and has an ornate border around it with a vignette of the company name. This item has the printed signatures of the Company's President and Secretary. PcOrder.com, Inc. provided business-to business software applications, content and related services that are designed to enable the computer industry's suppliers, resellers and end users to buy and sell product lines. The company's tailoured solutions were designed to enable computer industry participants to take advantage of the increasing adoption of e-commerce to automate sales and distribution functions. Company had a non-exclusive technology license agreement with Trilogy Software Inc, that enabled the company to develop products based on Trilogy's sales. As of December 1999, Trilogy owned approximately 62% of company's oustanding common stock. The company's products were being adopted by market leaders like Compaq Computer Corporation, AST, Dell Computers, CMP Publications Inc., GE Capital Corp., Hewlett-Packed Company, Ingram Micro Inc., IBM, Nortel Networks Inc. and SARCOM. In October 1999, company entered into an agreement with e-Commerce Industries, Inc that granted eci/2/exclusive rights to sublicense Pcorder's core e-commerce technology in the office products industry. Content and services accounted for 52% of 1999 revenues and software and subscriptions, 48%. EXCERPT: A federal judge in Austin, Texas, has refused to certify a class-action securities fraud suit stemming from the initial public stock offering for Internet company pcOrder.com because he found the candidates for class representatives lacked standing and/or competency and the proposed lead counsel suffered from conflicts of interest. He questioned whether the prospective lead counsel were "truly concerned about their clients' interests" since they had kept them in the dark. Krim v. pcOrder.com Inc. et al., No. 00-776 (W.D. Tex. Oct. 24, 2002). Plaintiff Jerry Krim filed one of many shareholder suits against pcOrder.com, its directors, its investment bankers and its parent company, Trilogy Software Inc., alleging violations of Sections 11 and 15 of the Securities Act of 1933 in connection with pcOrder's March 1999 initial public offering and a secondary offering nine months later. Generally, the shareholders charged that they lost tens of millions of dollars because pcOrder falsely claimed to have a viable business plan, the ability to report accurate financial information and freedom from competition from parent Trilogy Software. However, Krim did not seek the job of class representative in the Texas litigation and most of the plaintiffs who were initially in the lead role withdrew. Several shareholders came forward to take the class representative position, but the court found fault with their standing as shareholders or their competency to carry out the job. U.S. District Judge Sam Sparks disqualified two applicants because they could not prove that their stock was issued in the IPO or the secondary offering. Although they need not prove that they themselves bought the stock during the IPO, they must show that the stock they own was issued at that time -- not that it was probably issued then, the court held. It said the applicants who did have standing to sue would make unacceptable class representatives because they knew virtually nothing about the claims of the suit and the plaintiffs they would champion. Judge Sparks blamed that condition in part on the law firms that sought the lead counsel position. He said they had failed to inform their clients about their case or the parallel cases where those attorneys represented plaintiffs making similar claims against pcOrder and its directors. "Furthermore, counsel participated in a full week of settlement negotiations with defendants, who offered to settle all lawsuits against pcOrder.com," the court noted. "Although unsuccessful, the negotiations demonstrate the problematic nature of counsel's multiple representations in negotiations. "Judge Sparks noted that while it might, at a later date, be in the best interest of one group of plaintiffs to settle all claims, it might well be decidedly against the best interests of another group to settle at that point; moreover, it would be difficult or impossible for the attorneys to juggle their responsibilities to be both candid and protective of the rights of the various groups. In light of the fact that the prospective lead counsel failed to disclose their involvement in other lawsuits and negotiations and failed to prepare their clients for deposition in this case, the court refused to appoint the applicants to the lead counsel spot. It also denied the motion to certify the class.